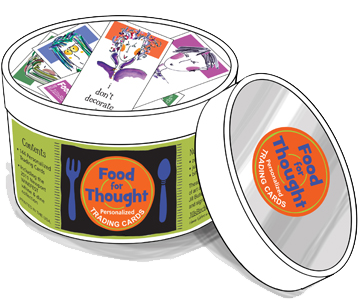 A selection of 100 trading cards with a mix of Food for Thought personalized messages for business, wellness, bar banter, thoughtfulness. There’s an appropriate and often surprising message for every encounter whether it's business networking, social connecting, birthdays or just for fun! Four lines of personalized data is offered with the Main Course. Icon handles with personalized addresses can be specified: Facebook, Linked-In, Twitter. Comes packaged in our classy tin. Cards measure: 1" wide x 2 3/4" long. FREE shipping.